Hosted by Chuck Weilamann, Team Leader of DBRS’s U.S. ABS Group, the discussion will feature commentary from senior member Sergey Moiseenko. 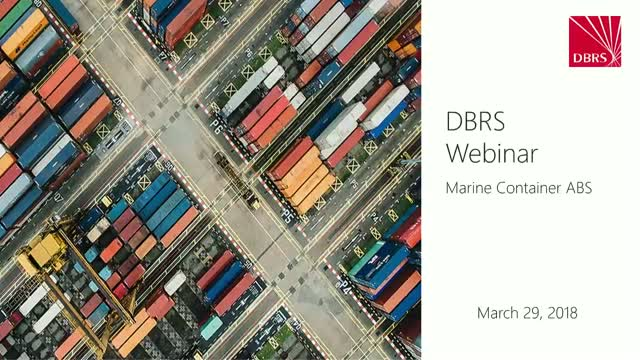 The pair will provide updates to rating marine container securitizations; recent challenges faced by the industry and how it responded; rating structures with shorter final maturities; and DBRS baseline cash flow modeling assumptions. DBRS Ratings Limited (DBRS) invites you to attend a webinar on rating Italian mid-corporates on 2 May 2019 at 3 p.m. BST/4 p.m. CEST/ 11 a.m. EDT. The webinar will be hosted by Valentino Daprile, Senior Vice President, European Corporate Credits, and Giuseppe Fresta, Vice President, Global Corporates in London. This webinar is inspired by the successful event “Italian Mid-Sized Corporates: The Market Evolution of Rated Bonds” DBRS co-hosted in Milan. The webinar will focus on the issuance opportunity and potential development of a bond market for Italian mid-sized corporates that could reduce the historical recourse to bank lending of Italy’s industrial system. It will also discuss how a rating can attract more bond investors, increase market liquidity and generate important pricing advantages. Lastly, DBRS analysts will discuss the opportunities of the private placement market for companies and investors and provide an overview of DBRS’s rating process. The discussion will last approximately 25 to 30 minutes and will be followed by an interactive question-and-answer session. DBRS welcomes all who wish to participate. DBRS Ratings Limited (DBRS) invites you to attend a webinar on new simple, transparent and standardised (STS) securitisations on 17 April 2019 at 3 p.m. BST/4 p.m. CEST, 10 a.m. EDT. The webinar will be hosted by Gordon Kerr, Head of European Structured Finance Research, in London and will provide an overview on STS transactions on their impact on the market. The discussion will last approximately 30 to 45 minutes. DBRS welcomes all who wish to participate. Key topics to be discussed include: the evolution of finance; FinTech's influence around the globe; growth hurdles; and securitization considerations. Hosted by Chris D’Onofrio, Managing Director, U.S. ABS, the discussion will also feature commentary from Gordon Kerr, Senior Vice President, Head of European Research and Imran Ansari, Vice President, U.S. ABS. by Gordon Kerr, Head of European Structured Finance Research, in London. in a state of flux. Where is it headed? Gordon Kerr will attempt to answer this question and provide further insights in to the state of the European securitisation market. The discussion will last approximately 30 to 45 minutes and will be followed by an interactive question and-answer session. DBRS welcomes all who wish to participate. Key topics to be discussed include: aviation industry performance; scheduled lease expirations; valuation and volatility considerations; and developments in DBRS's aircraft and aviation related methodologies. Hosted by Chris D’Onofrio, Managing Director, U.S. ABS, the discussion will also feature commentary from David Laterza, Head of U.S. Non-Bank Financials and Mark Hirshorn, Senior Vice President, U.S. ABS. DBRS's CMBS team provides an overview of the new CMBS Insight Model. DBRS Ratings Limited (DBRS) invites you to attend a webinar titled, “Non-Performing Loans - Emergence of a New Asset Class” on 12 February 2019 at 10 a.m. EST/3 p.m. GMT/4 p.m. CET. The webinar will be hosted by Gordon Kerr, Head of European Structured Finance Research, in London. Gordon will be joined by Elisabeth Rudman, Managing Director, Head of European Financial Institutions Group; Christian Aufsatz, Managing Director, Head of European Structured Finance; and Alessio Pignataro, Senior Vice President, European ABS. Topics discussed will concentrate on DBRS’s Sovereign, Financial Institutions and Structured Finance teams’ evaluation of performance and outlook for the European non-performing loans (NPL) market in 2019 and beyond. Europe’s banks have made significant progress in reducing the large stock of NPLs accumulated since the financial crisis, but a number of countries whose banks have high levels of NPLs still have a long way to go. DBRS has assigned ratings to 20 European NPL securitisation transactions to date (14 in Italy, four in the Republic of Ireland and two in Portugal) and rated these transactions with its methodology focused on servicer or sponsor expectations of recoveries. With only just over two years since the first publicly rated Italian NPL securitisation transaction was issued, it is still too early to know how these deals are truly performing. However, the data that DBRS has analysed has provided some interesting insights. Please join our analysts to discuss these topics in brief on 12 February. The discussion will last approximately 45 to 60 minutes and will be followed by an interactive question-and-answer session. DBRS welcomes all who wish to participate. DBRS Ratings Limited (DBRS) invites you to attend a webinar on the 2019 outlook for European structured finance and covered bonds on 24 January 2019 at 10 a.m. EST/3 p.m. GMT/4 p.m. CET. The webinar will be hosted by Gordon Kerr, Head of EU Structured Finance Research, in London. Gordon will be joined by Christian Aufsatz, Head of European Structured Finance, Alex Garrod, Senior Vice President, EU ABS, and Carlos Silva, Head of European Structured Credit. The year ahead looks to be a very interesting one for European securitisation. Big questions remain in the market, particularly surrounding the introduction of new regulations in 2019. How will the market react? Will CMBS continue its comeback? Will private equity firms continue to be regular issuers in the market? Will the removal of central bank support force banks back to the market? And will NPLs continue to come to market, developing as an asset class? The discussion will last approximately 30 to 45 minutes and will be followed by an interactive question-and-answer session. DBRS welcomes all who wish to participate. DBRS Ratings Limited (DBRS) invites you to attend a webinar covering the regions of the United Kingdom (U.K.) and its diverse array of household indebtedness on 29 November 2018 at 3 p.m. GMT/4 p.m. CET/10 a.m. EST. The webinar will be hosted by Gordon Kerr, Senior Vice President and Head of EU Structured Finance Research, and Nichola James, Co-Head of Sovereign Ratings, in London. The discussion will focus on which regions of the UK have highest mortgage debt and how this can be explained, and if the same regions have high consumer debt such as credit card debt and other non-mortgage loans. During the webinar, the differences in relation to risks to the economy and financial stability will also be assessed. the consequences of such an outcome on the UK’s sovereign rating. The discussion will also cover the potential impact on U.K. structured finance transactions. The discussion will last approximately 30 minutes and will be followed by an interactive question-and-answer session. DBRS welcomes all who wish to participate. Hosted by Chris D’Onofrio, Managing Director, U.S. ABS and David Laterza, Senior Vice President, U.S. FIG, the discussion will also feature commentary from Mark Hirshorn, Senior Vice President, U.S. ABS. Key topics to be discussed include aviation industry performance, aircraft liquidity, lessors and their financing alternatives, developments in DBRS's aircraft and aviation-related methodologies. DBRS Ratings Limited (DBRS) invites you to attend a webinar covering the European Non-Performing Loan Securitisations on 18 October 2018 at 3 p.m. BST/4 p.m. CEST/10 a.m. EST. The webinar will be hosted by Gordon Kerr, Senior Vice President and Head of EU Structured Finance Research, and Alessio Pignataro, Senior Vice President, EU ABS, Global Structured Finance in London. The discussion will provide updates and expectations on the growth, progress and future of the NPL market. There will also be discussion surrounding current and projected NPL deal performance. The discussion will last approximately 30 minutes and will be followed by an interactive question-and-answer session. DBRS welcomes all who wish to participate. Hosted by Chris D’Onofrio, Managing Director, U.S. ABS, the discussion will also feature commentary from Lain Gutierrez, Senior Vice President, U.S. ABS. The discussion will cover evaluating underwriting guidelines across various PACE programs, understanding differing state approaches to program validation, assessing legal requirements at the assessment level (i.e. local opinions), and determining the impact of pool concentrations. The discussion will focus on the growth in the equity release mortgage market and how the product works. It will also cover the way that DBRS looks at the market and how it assesses equity release mortgage pools. DBRS Ratings Limited (DBRS) invites you to attend a webinar updating you on its 2018 Structured Finance and Covered Bond Survey Results on 28 June 2018 at 3 p.m. BST/4 p.m. CEST/10 a.m. EST. The webinar will be hosted by Gordon Kerr, Senior Vice President and Head of EU Structured Finance Research, in London. The discussion will focus on the results of DBRS’s annual survey of securitisation and covered bond market participants. Overall, the results demonstrate a positive environment for the market with the majority of participants expecting to increase their activity in the next 12 months. Gordon Kerr will explore this development further along with other insights from the survey. DBRS Ratings Limited (DBRS) invites you to attend a webinar updating you on the Global ABS 2018 Recap on 14 June April 2018 at 3 p.m. BST/4 p.m. CEST/10 a.m. EST. The webinar will be hosted by Gordon Kerr, Senior Vice President and Head of EU Structured Finance Research, in London. For those that were unable to attend the prime securitisation industry event of the year, or perhaps spent the majority of it in meetings, DBRS offers the opportunity for our analysts to provide their key takeaways from the event. On the call, Mr. Kerr will be joined by Christian Aufsatz, Head of European Structured Finance; Paolo Conti, Head of European ABS; Carlos Silva, Head of Structured Credit; Alfonso Candelas, European Structured Finance Surveillance; Kali Sirugudi, European RMBS; and Mudasar Chaudhry, European Structured Credit. The discussion will cover all sectors and provide DBRS’s perspective on important highlights. The webinar will last approximately 30 minutes and will be followed by an interactive question-and-answer session. DBRS welcomes all who wish to participate. DBRS Ratings Limited (DBRS) invites you to attend a webinar on the re-emergence of European CMBS on 31 May 2018 at 3 p.m. BST/4 p.m. CEST/10 a.m. EST. The webinar will be hosted by Gordon Kerr, Senior Vice President and Head of EU Structured Finance Research, and Christian Aufsatz, Managing Director, Head of European Structured Finance, in London. The discussion will focus on the increased issuance in European CMBS in 2018, as well as the characteristics of the new transactions. There have been a number of innovations in the structures of European CMBS transactions, and Gordon Kerr and Christian Aufsatz will walk through these new features and comment on prospects for the market in 2018. DBRS Ratings Limited (DBRS) invites you to attend a webinar updating you on the first quarter for European structured finance and covered bonds on 19 April 2018 at 3 p.m. BST/4 p.m. CEST/10 a.m. EST. The webinar will be hosted by Gordon Kerr, Senior Vice President and Head of EU Structured Finance Research, in London. The discussion will focus on activity and performance of the European markets for securitisation and covered bonds. After a strong 2017 and the prospects of an easing of central bank funding looming, how have the European securitisation and covered bond markets reacted to 2018, and what are the prospects for the rest of H1 2018? DBRS Ratings Limited (DBRS) invites you to attend a webinar on Irish Mortgage Market: Performance improvement and market changes on 15 March 2018 at 3 p.m. BST/4 p.m. CEST/11 a.m. EST. The webinar will be hosted by Gordon Kerr, Senior Vice President and Head of EU Structured Finance Research, in London. The discussion will focus on the Irish mortgage market which has undergone several structural changes in recent years. Reform has revolved around the approach for managing delinquent borrowers and treating customers fairly. However, as the market continues to face political pressure, potential regulation is seeking to improve customer fairness among new originations. In DBRS’s view, house price appreciation and an improving economy have provided ample support for diminishing mortgage delinquencies. The improving performance has led to better prospects for residential mortgage securitisations, including transactions securitising non- and re-performing loans. DBRS is an independent, privately held, globally recognized credit ratings agency with offices in Toronto, New York, Chicago, London, Frankfurt and Madrid. Founded in 1976 in Canada, DBRS is growing rapidly internationally. DBRS’s four decades of experience and strong track record are the foundation to seek out new opportunities and to make targeted investments aligned with its core ratings operations. As the world’s fourth-largest ratings agency, DBRS’s approach and size provide the agility to respond to customers’ needs in their local markets, while being large enough to provide the necessary expertise and resources.